SAINT BERNARD, Southern Leyte – Southern Leyte District Congressman Roger G. Mercado seek for the proper implementation of Republic Act 10121 or known as an act strengthening the Philippine disaster risk reduction and management system, approved last May 2010. 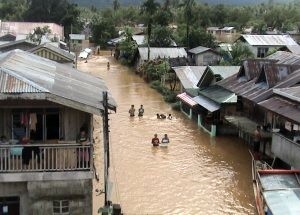 The congressman likewise urged the municipalities, particularly those calamity-prone areas to help the government implement properly the disaster risk reduction law to minimize if not avoid tragedies like what happened to the past, referring to the flooding and landslide incidents that killed three minors few weeks back. “RA 10121 is understandable,” he disclosed and added that he will ask for a review of the law if it is enforced or if there are some lapses. “It is now time to agree for a relocation – for the lasting safety of the residents,” he said. Cong. Mercado who was happy upon the arrival of Pres. Aquino to respond to the problems of the local government, specifically in Saint Bernard, bared for a possible scenario for the residents who lived in a calamity-prone place. “A re-channelling of the Lawigan River, a permanent relocation for the residents, the after-effect of the tragedy which will include a relocation site, food and shelter, their means of livelihood and the like,” he told. While the disaster risk reduction law will recognize and strengthen the capacities of the local government units and communities in mitigating and preparing for, responding to and recovering from the impact of any disaster. Cong. Mercado who welcomed the President Aquino and his entourage was with Vice-Gov. Miguel Maamo, Saint Bernard Mayor Rico Rentuza, Sangguniang Panlalawigan members, local and national government employees. QUEZON CITY – Sen. Vicente Sotto III’s recent pronouncement against the controversial reproductive health (RH) bill caught the ire of a group of women advocates. Democratic Socialist Women of the Philippines (DSWP) represented by its National Chairperson Elizabeth Angsioco calls on Sen. Sotto to stop irresponsible talks and instead do his job. According to Angsioco Sen. Sotto’s responsibility is to facilitate the legislative process, not derail it. This includes calendaring bills already reported out by the Committees for plenary debates. “Saying that he would rather be replaced from his position than see the RH bill enacted into law reeks of arrogance. It’s proof that the good Senator only cares about what he personally believes in, even if this runs counter to public welfare,” stressed Angsioco. “If he truly is a statesman, he would not impose his personal opinion on the whole nation. Using his important position as the Senate Majority Leader to derail the legislative process is being untrue to his mandate as a lawmaker. If he doesn’t want to do his job, then he should resign,” said Angsioco. ‘Contrary to his perception, an RH law will provide all family planning methods, meaning, both the natural and modern methods will be equally available,’ Angsioco explains. “Most importantly, Sen. Sotto must realize that the RH bill goes beyond providing contraceptives, it is about responsible parenthood, arresting maternal morbidity and mortality, training of skilled birth attendants, upgrading of hospital facilities and services, RH education for the youth, HIV and AIDS prevention, and many others, ” said Angsioco. “Sen. Sotto must sit down with the bill’s proponents so he will understand its merits and perhaps realize that his opposition is misplaced. After doing that and he still refuses to perform his responsibilities as Majority Leader, then he should resign or be replaced,” she ended. QUEZON CITY – With the considerable number of Local Government Units (LGUs) in the country still not complying what is required in the provisions of RA 9003 or the Ecological Solid Waste Management Act of 2000, the Environmental and Management Bureau (EMB) issued a final notice to 360 LGUs in the country to adopt the Ecological Solid Waste Management (ESWM). EMB Assistant Director Gilbert Gonzales relayed this information to the information officers of the Philippine Information Agency coming from the different PIA regional offices in a press conference held here Thursday in the conference room of PIA Central Office. Assistant Director Gonzales said that despite the enactment of RA 9003 ten years ago, there were LGUs that did not bother to implement ESWM in their area. Included in the final notice issued by EMB is the establishment of Material Recovery Facilities (MRFs) in all barangays nationwide, he said. Section 10 of Chapter II of RA 9003 provides LGUs to be primarily responsible for the implementation and enforcement of the provisions of this Act within their respective jurisdictions pursuant to the relevant provisions of R.A. No. 7160, otherwise known as the Local Government Code. He emphasized that LGUs not complying with RA 9003 is penalized in the amount of P500,000 and will also be slapped with a criminal complaint. However, he said that there were many LGUs in the country which already complied with RA 9003. He further said that the financial capability of LGUs is one of the reasons why there are LGUs that did not comply with RA 9003. It will require 20 to 30 million pesos to establish a sanitary landfill having an area of two to three kilometers in size which is required by RA 9003 plus the additional cost of maintaining it. Assistant Director Gonzales hoped that the 360 LGUs notified to adopt ESWM will comply to avoid being penalized and to help solve the problem on waste disposal. The compliance of LGUs compliance would also contribute in maintaining a wholesome and clean environment, he said. CATBALOGAN, Samar – The Sangguniang Panlalawigan of Samar formally approves a resolution that declares the entire province under a state of calamity in its session held last January 13. 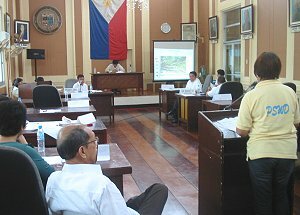 Samar provincial social welfare officer Luz Tacal (standing) presented to the provincial board during its regular session on January 13 the extent of damage caused by landslides and flooding in the province of Samar. The board adopted and passed a resolution as recommended by the Provincial Disaster Risk Reduction & Management Council declaring the province under a state of calamity. Initial damage to crops and infra is valued at P38.8M and P76M respectively. The declaration was based on a proposed PDRRMC Resolution No. 01, s2011 which recommended for its declaration after conducting a three day deliberation and on-site assessments of the extent of damages in flooded areas. It has placed the entire province under a state of calamity with estimated damages amounting to 38.8 million in agriculture and 76 million in infrastructure. The persistent rains that started since January 3 resulted in flashfloods and landslides that affected 152 barangays consisting of 12,384 families and 59,143 persons. The PDRRMC reported destruction of bridges, roads, houses and potable water sources. This was vividly shown in a power point presentation at the session hall to convince the SP members of the extent of the damages. In the same venue, the attendance of Ms. Luz Tacal of the Provincial social Welfare Development Office; Ms. Anita Taran of the Office of the Provincial Agriculture and PNP Provincial Director, Col. Tomasito Clet were requested to thresh out in detail the urgency of the declaration and risk reduction and management plans that have to be implemented. In its deliberations, both Taran and Tacal were not ready and specific in their assessments and contingency measures. They failed to accurately answer the questions raised by council members of the 1st district as to the exact amount necessary to assist flood victims and the various programs and activities required in the rehabilitation of the reported damages in agriculture and infrastructure in the province. It was observed that reports coming from the municipalities were not complete and unsigned by the mayors. It was expected that these reports were also indorsed by the MDRRMCs convened by the respective municipalities. Other board members did not fail to express their apprehensions in approving the resolution considering the expected release of a huge amount which comprises the 5% calamity funds of the province, estimated at 40 million pesos. Once the declaration is in place, the legislative body will no longer have control over its disbursements. It was PNP Director Clet’s statement of alarm over the unpreparedness of the province in these calamities that has laid premise for its approval. Candidly, Clet said that “this is the first time that I have learned that there are funds reserved for this purpose, yet the province has no preparations to address these calamities especially on its preventive side. Let’s equip the PDRRMC with capability trainings and purchase of rescue facilities such as flashlights, batteries, raincoats, life boats and other rescue needs”. He further states that his attendance to the PDRRMC was the first time since his assignment in Samar. According to him, his sponsorship of the resolution was a result of the realistic assessments that were submitted to him by police officers in the PNP. The Provincial Disaster Risk Reduction Management Council, formerly known as the Provincial Disaster Coordinating Council, is supposedly to be convened quarterly. However, the provincial government has always been criticized for being non-functional in the past years. “With the declaration approved by the council, we have no option left but to monitor that calamity funds are disbursed wisely and efficiently. I am hoping that the present administration will be reminded of the controversy that former Gov. Mila Tan has experienced, where graft cases were filed because of abuse of people’s money. I consider the appropriateness of the declaration as it will be helping the Samarnons, but I’m appealing to the present administration that they conscientiously and effectively consider the plight of their constituents. I also encourage every Samarnon to be more vigilant and help in the monitoring of related activities to ensure that public funds are not wasted and used for the interest and welfare of every Samarnon”, a MATA-Samar member whose anonymity is requested, elaborates. SAINT BERNARD, Southern Leyte – Landed at the grounds of Barangay Malibago, January 14 in the town of Saint Bernard, President Benigno S. Aquino III expressed his reactions on how to assist the people in the calamity-prone area of Saint. Bernard. Boarded on a Presidential chopper that arrived almost 10 in the morning here, the awaiting residents were seen excited and happy as they saw the President stepped down for the first time in their town to assess the landslide and flooding incidents that took away three minors and evacuated 1,280 families or 5,051 individuals, as of press time. The President in his visit here wanted to know what should be done, because the town lies in mountain ranges – “if an evacuation is needed, we should identify where these people would be transferred, for a long term solution to the repeated problem of this town,” the President said. He pledged to continue assisting the victims of the tragedy specially those who have no other means of income but farmlands. He brought along Department of Agriculture Secretary Proceso Alcala to distribute 100 bags of certified rice seeds and at least 500 bags of vegetable seeds to help the farmers rebuild their lives. Meanwhile, the President conducted a ceremonial distribution of at least 10 family packs to ten beneficiaries. There were 300 family packs prepared to be distributed to the residents managed by Department of Social Welfare and Development Secretary Corazon “Dinky” Soliman who was also with the entourage of the president during the short visit here. Other assistance brought by President Aquino were assorted drugs and medicines through Department of Health Secretary Enrique Ona and some 196 PhilHealth cards. Other dignitaries who were with the President were Presidential Spokesperson Edwin Lacierda, Department of National Defense Secretary Voltaire Gazmin, among others. For the province of Southern Leyte, Cong. Roger G. Mercado, Vice-Gov. Miguel Maamo, Saint Bernard Mayor Rico Rentuza, national, provincial and local officials welcomed the President. CALBAYOG CITY, Samar – Calbayog City’s one of the most wanted persons was finally arrested after years of hiding. By virtue of a warrant of arrest issued on March 20, 2009 by Manuel F. Torrevillas, former presiding judge of Regional Trial Court Branch 32, Joel Rama Cañete was captured by Northern Police District Special Operation Unit of NCRPO (National Capital Region Police Office) on January 5, 2011 in Taruza, Cavite. NPD’s Special Operation Unit headed by PSupt Jose Hidalgo turned over the suspect to Calbayog Police Chief Nestor Valenzuela in the morning of January 11, 2011 at Calbayog Domestic Airport. While in custody of NCRPO-NPDSOU and the composite team of the city and the Provincial Mobile Group, Cañete was escorted from the airport up to RTC Branch 32. While waiting for the court’s commitment order, Cañete’s immediate family has arrived and they were given a chance to talk and reunite. Despite refusal for a media interview, suspect’s relative said that they were planning to avail the services of the Public Attorney’s Office. Court record revealed that Cañete and his brother-in-law Ramon “Montac” Ventures were the suspects of an alleged ambushed occurred on August 14, 2007 at Corner Pido and JD Avelino Sts, Brgy. West Awang this city against councilor Jonas Montealto and killing his driver Reynaldo Ongcal. Empty shells of .45 caliber and 9MM pistols were recovered from the crime scene. Murder and frustrated murder were filed in court by the aggrieved party against the suspects. While waiting for his arraignment, he was immediately delivered to Calbayog’s Bureau of Jail Management and Penology while his co-accused Ramon Ventures is still at large. NAVAL, Biliran – Some 20 hectares of rice plantations in the municipality of Caibiran in the province of Biliran were flooded due to the continuous rains being experienced in the province for the past weeks. This was revealed by Mr. Jaime Casas, Provincial Agriculturist of Biliran in a mobile phone interview with the Philippine Information Agency (PIA) -Biliran. He informed that rice plantations that were affected and some totally washed out were in their vegetative stage and others newly planted. Likewise, some rice farmers in said municipality who were about to start planting were unable to do so because the beds of rice seedlings were either washed out or covered with mud. Mr. Casas said that as of now he cannot determine yet if there were damage to rice plantations and other crops in the rest of the municipalities in the province as they are still in the process of assessment. He added that a team from the Office of the Provincial Agricultural Services (OPAS) in Biliran is currently going around the province to assess the damage to crops. However, he clarified that the continuous rains left no serious damage to fruit trees and vegetable plantations in some areas of the province. Meanwhile, Ms. Nascencia Abad, Municipal Agriculturist of Naval, the capital town of Biliran province reported in an interview with PIA that damage to rice farms were noted in the area. Some rice farmers were able to plant during the planting season but the rice fields were flooded when continuous downpour started to set in. She informed that rice seedlings ready for transplanting were drowned and washed out. “Other rice farmers who harvested their rice when continuous rains started were not spared from the damage because rice stocked in the ricefields started to sprout even before they were threshed,” she said. According to Ms. Abad, the damage was doubled when pests called “rice black bug” started to attack some rice plantations of Naval farmers. She then advised the farmers to go to the OPAS and ask for some pesticides that control and eradicate this kind of pest. “I also encouraged the Naval rice farmers to insure their crops with the Philippine Crop Insurance Corporation (PCIC) so that they will have something for the next planting season and the effects of the damage will not badly affect them financially,” she said. “Fruit trees and banana plantations in Naval were also affected by the continuous rains these past weeks. Mango growers were unable to spray bloomers to their mango trees, hence, fruit bearing will be delayed,” she informed. As of this report, the Office of the Municipal Agriculturist of Naval is still progressing in their assessment of the damage to crops in the entire municipality. QUEZON CITY – The number of families and persons affected by the continues heavy rains, subsequent floodings and series of landslides brought by the tail-end of a cold front increased based on the latest situation report from the National Disaster Risk Reduction and Management Council (NDRRMC). Based on the NDRRMC update released today, January 13, 2011 duly signed by Usec Benito T. Ramos, Executive Director, NDRRMC, the number of population affected increased from 248,223 to 259,048 families and from 1,294,039 to 1,340,015 persons. The affected population came from the 1,429 barangays of 146 municipalities and 15 cities of 24 provinces in Regions IV-B, V, VI, VII, VIII, X, XI, CARAGA and ARMM, based on the NDRRMC report. Region VIII followed in the number of affected population with 66,341 families and 338,064 persons while Region V ranked in third spot with 40, 202 families and 205, 571 persons, it stated. The NDRRMC report also mentioned that there are 70,568 families and 369,436 persons who have been served both inside and outside evacuation centers from the combined sources of DSWD and LGUs. The report stated that there are 37 evacuation center in Albay that remained open and still serving 2, 405 families and 12, 360 persons in the municipalities of Bacacay, Camalig, Daraga, Malilipot, Manito and Sto. Domingo while Region VIII has 35 evacuation centers remained open and still serving 1,081 families and 4, 820 persons in the municipalities of Borongan and Maslog of Eastern Samar and in the municipalities of Bontoc, St. Bernard and Sogod of Southern Leyte. A total of 42 dead, 8 injured, 6 missing persons have been recorded as of today, January 13, 2011 based on the NDRRMC report. It reported also 443 totally and 919 partially damaged houses with Region VIII recorded the highest number of damaged houses that reached to 744 and the lowest in Region V with only one house damaged. Damages to agriculture, infrastructure and private properties has reached to a total of P1,045,713, 449.80 with infrastructure incurring the biggest damage with P687,092,271 followed by agriculture with P337,624,878. 80 and private properties with P20,996,300. It was shown in the report that the estimated cost of assistance from the combined resources of DSWD, DOH, LGUs, NGOs, and other GOs reached up to P36,962,494.37. 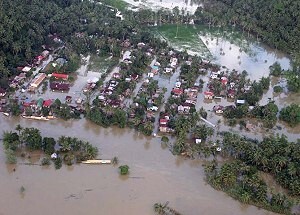 The NDRRMC report enumerated the municipalities and cities in the affected areas that were declared under a state of calamity as follows; Surigao del Sur in CARAGA, Butuan City in Agusan del Norte, Bunawan, Esperanza, San Francisco and Sibagat in Agusan del Sur, Surigao City in Surigao del Norte, Talaingod and Sto. Tomas in Compostela Valley in Region XI, Saint Bernard in Southern, Leyte and Eastern Samar in Region VIII and Albay province and Juban, Sorsogon in Region V.
BORONGAN, Eastern Samar – The Eastern Samar Risk Reduction Disaster Management Council (RRDMC) through Pregerio Balase, RRDMC Coordinator, reported that the province of Eastern Samar now endures damages worth P 143, 348. 071. In a partial report, as of today the municipalities of Balangkayan, Can-avid, Dolores, Jipapad, Taft, Oras, Maslog, San Julian, Salcedo, Borongan, Sulat and Llorente have been affected by the floods that swamped Eastern Visayas since the New Year. Some 180 barangays have been affected while 19,761 families have been affected. Some 1,122 houses have been partially damaged while 297 houses were totally destroyed with Can-avid town leading the most number of damaged houses at 241. As to agriculture, palay damages amounted to P 43,684,415.00 while other crops damages amounted to P 15,062,056.00. Reported dead/missing rose to six; one from Dolores, two from Oras, one from San Julian and two from Borongan. Damage to infrastructure amounted to P 91,335,600.00. As of press time, the two bridges, Borongan Bridge (located in Barangay Sabang, Borongan) leading to the capital town from the north is now passable using only one lane. Police authorities man the area to regulate the flow of traffic. On the southern side of Borongan, some two kilometers from the town proper, Can-Obing bridge is also manned by the PNP as vehicles with more than 7 tons cargo are prohibited from passing. Tankers, 10-wheeler trucks have been warned to reduce their load to be able to pass the critical bridge. CATARMAN, Northern Samar – Due to continuing heavy rains, Northern Samar affected families now reaches 35,906. This was learned from the Provincial Disaster Risk Reduction Management Office (PDRRMO). Partial reports shows Mondragon topping the number of families affected by the continued heavy rains that prevailed the province for more than a month now which has 6,729 families, followed by Las Navas with 6,014 families; Bobon which has 4,453; Lavezares, 3,667; San Jose, 3,600; San Roque, 3,014; Catarman, 2,779; Rosario, 2129; Palapag, 1969; San Antonio, 1,404; and Lope de Vega, 145. Relief goods like rice, noodles and sardines were already distributed to some affected barangays in the province. The provincial government continues to monitor and assist the affected families of the heavy rains that beset the area. Meanwhile, DPWH reported today that another roadslip occurred for about 30 meters long in Catarman-Calbayog Road in Brgy. Washington, which is 3 meters away from that roadway that collapsed five days ago in Brgy Macagtas and Washington. DWH said that damage on infrastructure for the first engineering district is estimated to P85 million excluding the second engineering district which is enumerated as follows, the Catarman-Calbayog road in Brgy. Macagtas and Washington (collapsed roadway) 75 meters long - P25 million; Allen-Catarman Road in Brgy. Old Rizal - P10 million; Catarman-Calbayog road in Brgy. Washington (roadslip) 30 meters long - P20 million; and Bugko-Nenita road in Brgy. Nenita, Mondragon (roadslip) 250 meters long - P30 million. According to DPWH, the 110 meters detour road in Brgy. Macagtas and Washington is now passable to light vehicles only.